A leave of absence from work was what I had to take to figure out what was going on! The couch and I spent lots of time together! I didn’t want to eat because I wasn’t sure if it was going to stay down, but I forced myself to eat a few crackers and keep drinking water. I knew I needed to put something in my stomach to help fight whatever was going on with me! My husband took me to the neurologist at our local hospital (also 20 miles away). My farmer husband was in between summer farm work and we both wanted to hear what he had to say. Since I was so severely dizzy he got me set up to do an IV steroid drip at the hospital that day and for the next 2 days on an outpatient basis. After that he wanted me to go to his office for a series of tests including an MRI and a lumbar puncture (spinal tap)! Yes, you read that right. He thought it was MS with the vision problems, so that was the path we were going to test for. The IV drip cleared up my vision, but not my “corset” discomfort. My local doctor did a blood test and arranged for us to go back to the city and see an endocrinologist (gland specialist). So, in that next week we were headed back to the big city to see a different doctor. This one told me it was Graves’ Disease. That meant my thyroid was an OVERACTIVE thyroid producing too much (thyroxin) secreted stuff for my body and the only treatment was removal of my thyroid. 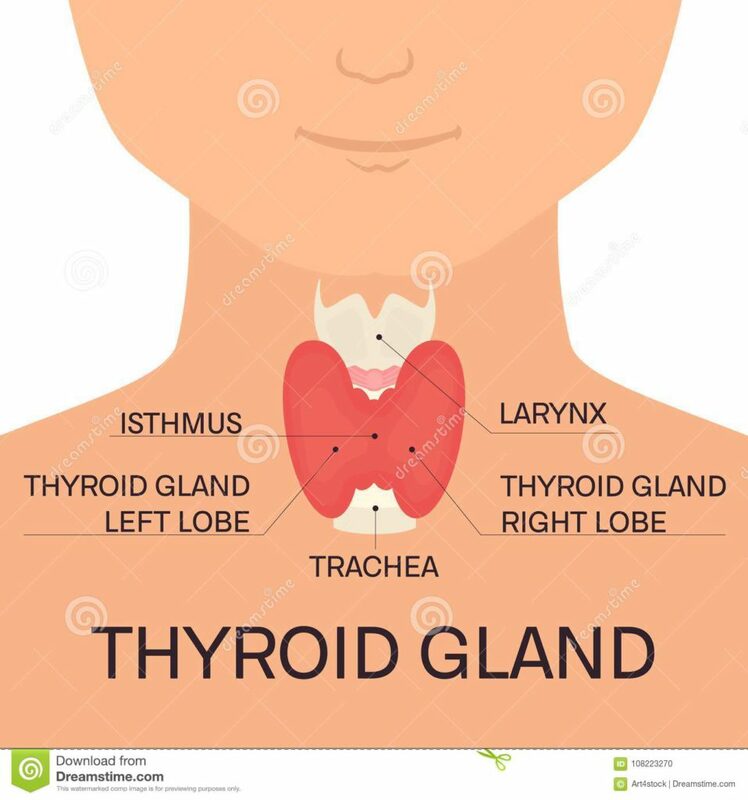 For those of you that aren’t familiar with what your thyroid does, it is that little gland around your throat that controls most of what goes on in your body, such as weight loss/gain, your body temperature, and your monthly cycle for women. How does it know what gland to “attack”? Am I going to appear radioactive? What’s it going to cost if it’s that easy? When he came back he had a glass of water, a big horse pill in a little paper cup and was wearing a pair of surgical gloves. Ok, you’re wearing gloves to bring this pill, but I just put it in my mouth and swallow it with bare hands? Ok, my tightness did eventually go away, so I guess it killed the right organ! I later found out that pill (the size of my thumb nail) cost $800 in 1995. My tests showed NO SIGNS of MS, none on MRI or the lumbar puncture! He said I needed to start these (expensive $1000/month in 1995) MS drug injections. I told him I wasn’t going to because we wanted to have kids and I wasn’t putting that medicine in my body when it WARNS YOU AGAINST PREGNANCY. That’s the first time I got the feeling from a doctor that if you’re not going to do what I say, then I’m not listening to you. That’s when my husband and I decided to find another neurologist as we walked out of his office. I started having what I call MS “episodes”. It happened at random times, usually in the mornings, when I went to the bathroom, but not all the time. I would get EXTREMELY hot, start sweating, get a buzzing in my ears so I couldn’t hear anything and my vision would just black out. Once I got cool it would only last about 10-15 minutes then I could go about my day! I tried to connect it with stress, what I had done in my life, what I had eaten, the weather, but nothing was the same! I started thinking “Oh great! More lesions on the brain”. But that wasn’t the case as I got more MRIs in years to come. It still happens, but rarely!!!! The joke with the MRIs was I had proof that I HAD A BRAIN. We have great insurance so we only had to pay 20% of that MRI bill. I went back to work about 3-4 weeks later, but soon learned that I had to cut back to 4 days a week. I couldn’t keep up working 5 days a week, helping on the farm when I got home, feeding us when my husband got done at night, plus laundry and keeping our house picked up as much as I thought a “good wife” should. We had agreed I would stay home with kids when they came. That didn’t mean that my husband wouldn’t have just as much raising them. It just meant that when he was doing something kids could be around safely he would take them and bring them back when it wasn’t safe. Besides Grandma, Grandpa and Uncle were at the farm with lots of attention to give! The rest of my medical story is listed if you want to read, but let’s get on with cooking.